Take 45-90 g of gel (0.5–1 sachet = 3-6 tablespoons) in small portions immediately after training. 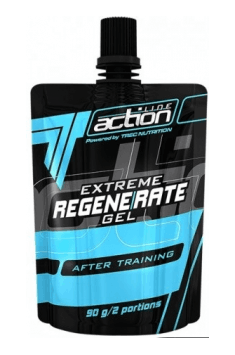 The product will be perfect for people who do not have much time for regeneration between training units or who perform two training sessions a day. To reduce muscle damage and support anabolism, I recommend combining the gel with a protein supplement that provides all amino acids. Supplement containing carbohydrate, vitamins and minerals. Accelerates regeneration and helps to burn calories. Collagen hydrolyzate (FORTIGEL) obtained by enzymatic hydrolysis of collagen, which is a major ingredient, building up connective tissue (tendons, ligaments cartilage, bone, and blood vessels), from the group of fibrous proteins (i.e. fibrous scleroproteins). Patented formula of collagen hydrolyzate, forming amino acids (such as proline, glycine, hydroxyproline and hydroxylysine) connected by peptide bonds. It is a substance easily digestible and well assimilable . Recommended in sports supplementation and for people, who are particularly active, as well as during convalescence after injuries and certain diseases. Dosage: 10-20g per day (normally used in supplementing).